“Rest brings restoration.”- words given to me by my Father. Have you ever received a few words that bring an immediate change in perspective? These did for me. In the summer of 2007, after a cycling accident brought many weeks of forced downtime from my active lifestyle, my patience was tested. I asked my Dad for some words. Without hesitation he said: “Rest brings restoration.” Just like that. These three little words soothed me. These words calmed my impatience. These words transformed the time of waiting into a greater purpose. Not just one of repair, but something more, a deeper healing…Renewed, restored, regenerated, revitalized. His words gave me an immediate shift in perspective- a move to an understanding you can’t rush the healing on your time table. Wait and it will be given. A bigger movement. Like a broken bone, it is stronger when healed. Fused in strength. When we are broken, it is our mindset that makes the difference to bring us to a place of strength. So, no more was I rushing time. Dad’s words allowed me to see something bigger. Rest. Brings. Restoration. All in three words. The little things in life are big. My dad. My father is a source of strength in my life – in his presence and in his words. He is a guiding foundation of being positive and has a rooted foundation in faith and goodness. 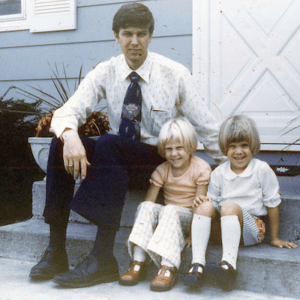 Photo: From the early 1970’s – My dad, sister Julie 14 months older, and me (right).